August 10-13, 2015. Congratulations to Owner Leah Hebert, Paul Hebert and Capt. 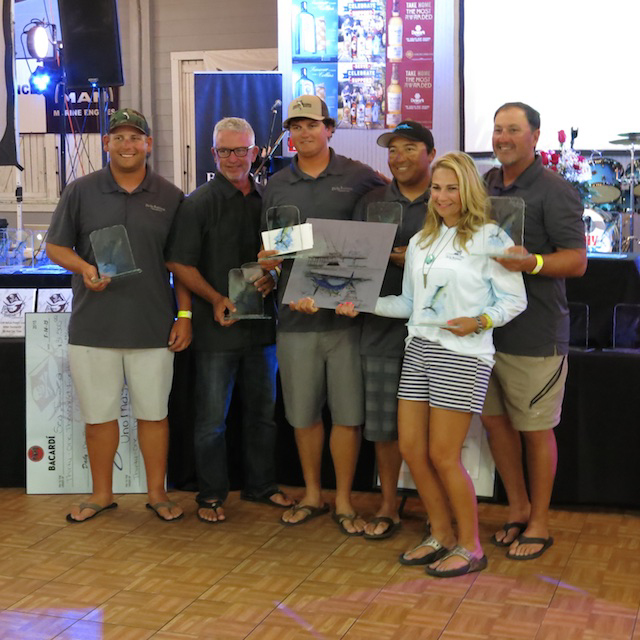 Newt Cagle plus crew and team of Tom Bauer, Tony Heurta and Junior Bass aboard the 58-foot DIRTY BUSINESS for taking third in the 32nd Annual Pirate’s Cove Big Game Tournament. The release of nine white and one blue marlin, based on time, totaled 1000 points for DIRTY BUSINESS! A total of 322 billfish were caught and released during the tournament and over 400 anglers participated. Again, huge congratulations to the owners and crew of DIRTY BUSINESS!